running | Random Thoughts: If not now, when? Last night I saw on television a rerun of Monk, which is set in San Francisco. Imagine my surprise to find Toronto locales popping up again and again. Obviously the street scenes, aside from a few establishing shots, were taped here. And that reminded me of TV Tropes: You Fail Geography Forever. Mr. Monk is an obsessive-compulsive investigator who consults with police to solve mysteries. I knew it was an old show because Monk’s original nurse/keeper/assistant, Sharona, was with him. As a down-to-earth normal person, she had enough edge in her interactions with him to keep the show interesting. As the story opened, they are at the finish of a marathon road-race, watching for Monk’s old childhood hero to come in. Then they walk away and come across a tragic scene: a woman has fallen from her apartment–or was she pushed? The plot turns on whether someone running in the marathon could have slipped away to commit murder. The investigators look at places where the marathon was run. The street scenes showed familiar Toronto buildings from the heart of downtown. The show stitched together a park in the Don Valley, near the Don Mills exit and a few km north of the lake, a park on the lake with the Leslie Street Spit in the background, what might have been a glimpse of High Park and Grenadier Pond on the other side of town, an office building with a fenced-in parking lot, oh yeah—fences topped with barbed wire—and finally, a mere footrace away, Cherry Beach. It was fun but distracting as I tried to keep track of all the locations and how they are really oriented. I should be used to it since finding, in an episode of K9, that a public school between north-south streets near Danforth Avenue and a distinctive fountain downtown on Front Street West outside the Flatiron Building were in fact across the street from each other. Road races do not take long detours though isolated parks, although they might be set entirely in parks. 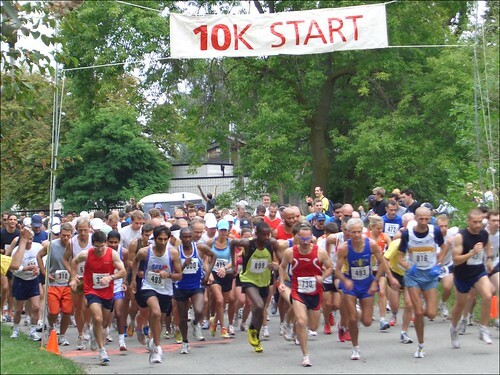 (See the Longboat Roadrunners 10K or the Harry Rosen Spring Runoff). Chip timers belong to the company doing the timing and must be returned to them. The number of each is recorded against the runner’s bib number. Chip timers contain a solid-state circuit that echoes an ID number when they go over a weak radio detector. They are generally on fabric straps that fasten around an ankle with VelcroTM. They ensure that your finish time is accurate. Chip timers are detected only at the finish line: everyone’s race officially starts at the same time and there are no checkpoints in any marathons I’m familiar with. Instead, there are race marshals and in some places temporary fences to make sure that runners don’t miss course turns and to keep spectators and drivers off the road. To do them credit, the directors avoid taping Toronto’s distinctive red, white, & black streetcars. Nor did I notice TO’s unique circular lock-stands for bicycles. We’re back from a very brief trip to Lindsay for AthleticKid to swim/bike/run a kids’ triathlon. This is her first one of the season. She put in a respectable time and moved up three places from her performance last year — in her estimate, measured from last place. And who knows, some day it might lead to longer runs. I finally uploaded the videos of our granddaughter in the Orillia Kids of Steel triathlon. Andie-tri-start, originally uploaded by monado. The swim was 300 yards: three times around the short course. The first one, the swim start, is the longest video at ninety seconds. The others are under twenty seconds: one of the 5-km bike race and one of the running finish. Andie-tri-bike, originally uploaded by monado. Andie-tri-finish, originally uploaded by monado. The results and pictures of yesterday’s marathon and half-marathon are up. The start!, originally uploaded by Longboat Daily Express Editor. 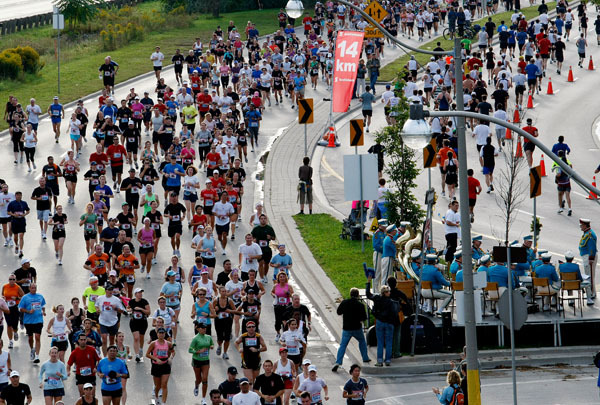 Every year, the Longboat Road Runners running club puts on a foot race on Toronto Island. It’s a fast, very flat course. But first, you have to take a ferry to the island. This year’s race was held last weekend on September 21. The pictures are up on Flickr. One of my first fun groups on the Internet was the Dead Runners Society. It’s a worldwide virtual running club discovered by LotStreetWiz. Through it we’ve made friends and acquaintances, learned more about other countries, met contacts on our travels, and even learned more about running and physical fitnesss training. The DRS has evolved from a simple running club to a multi-interest group with regional subgroups such ad SOBER, the Southern Ontario & Buffalo Expired Runners, training specialities such as Tri-deads for triathlon training, and just plain hanging out for fun. Into the latter category falls the World Conference. 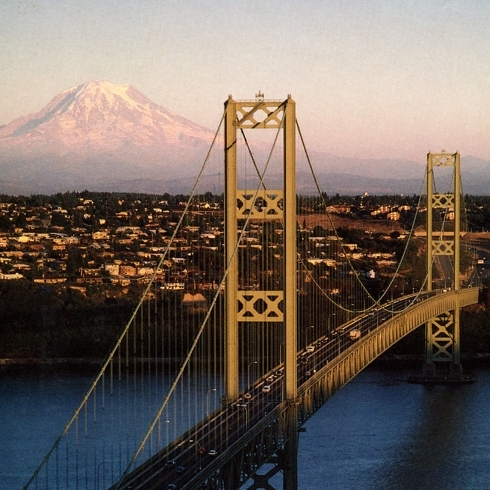 Here are a few notes about the 2008 DRS World Conference, which was held in Tacoma last June.